During a recent visit at Soul Fire Farm with Leah Penniman and Jonah Vitale-Wolff, we talked about their Black and Latino Farmers Immersion 2014 this summer and ate a delicious wholesome meal. I was so inspired and if that was not enough, I watched Leah dance around her kitchen and add a bit of this and a bit of that to her food processor as she made falafel. We talked about acarajé and other delicious soaking legume recipes. For tonight, I adapted her recipe. The baked falafels were delicious. I served with a salad and tahini sauce. I do not like frying, and was not a bit disappointed with this baked version! 1. Soak the chickpeas overnight. DO NOT COOK. (This is so important. Authentic falafel has no flour to bind because the soaked chickpeas bind themselves). In the morning, rinse and drain chickpeas. 2. in a food processor or blender, blend the chickpeas adding the olive oil and lemon juice (but slowly not to be too wet) until you get a nice puree. 3. add the remaining ingredients and continue blending. 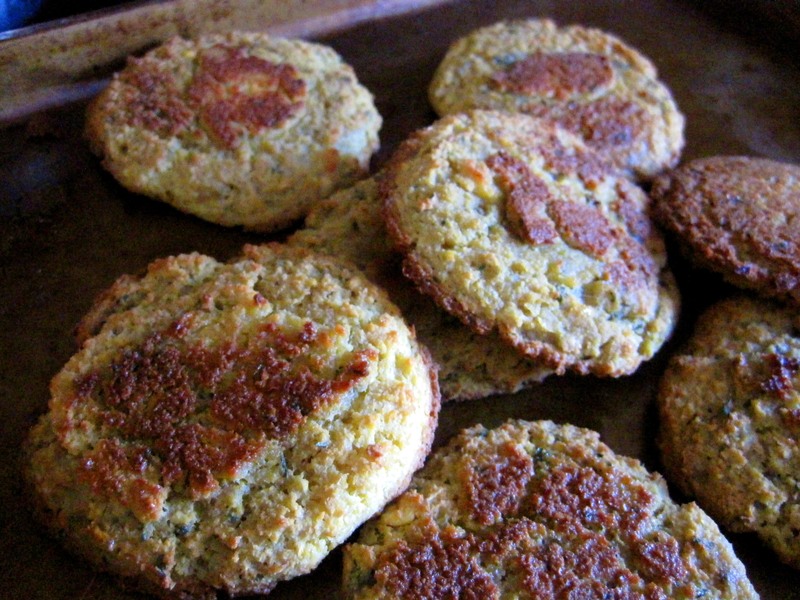 6. put the falafel on the prepared pan and drizzle some olive oil over them. Bake on a 375F oven until golden all over, 10 to 15 minutes on each side. If you would like to fry them, she says: heat 1 inch of oil in a large skillet over medium-high heat. Fry patties in hot oil until brown on both sides. For the Tahini Sauce: Whisk 1/4 cup tahini, 2 tablespoons warm water and salt to taste until smooth. To serve, drizzled the sauce over falafel.